Some time ago, Jonathan A. and I inked a deal to swap Nationals for Indians. I received his cards some time ago, but have yet to post the great stuff he sent my way. I'll get on that soon, I hope! In the meantime, the featured card of the swap is the one above. 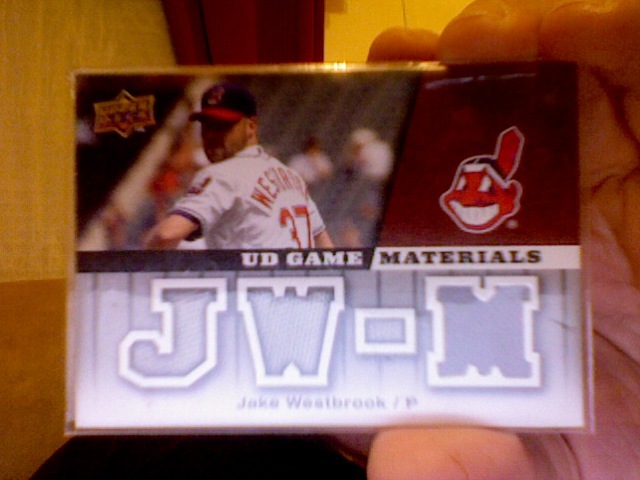 It's a 2009 UD Game Materials Jake Westbrook Jersey! It's a great-looking card, and you can't tell from the pic, but the "M" is where the jersey swatch is located.